Contents: G.L. Murphy, Meaning and Concepts. B.C. Malt, Word Meaning and Word Use. P.J. Schwanenflugel, B.G. Blount, P-J. Lin, Cross-Cultural Aspects of Word Meanings. J. Hampton, The Combination of Prototype Concepts. E.J. Shoben, Predicating and Non-Predicating Combinations. M.G. McKeown, Learning Word Meanings From Definitions: Problems and Potential. S.A. Stahl, Beyond the Instrumentalist Hypothesis: Some Relationships Between Word Meaning and Comprehension. D.A. Balota, R. Ferraro, L.T. Connor, On the Early Influence of Meaning in Word Recognition: A Review of the Literature. P.J. Schwanenflugel, Why Are Abstract Concepts Hard to Understand? C. Chiarello, Interpretations of Word Meanings by the Cerebral Hemispheres: One is not Enough. "This is one of the most interesting books I have read for a long time....On the evidence of this book, it is clear that significant work on lexical semantics is being done by psychologists, work that linguists cannot afford to neglect." 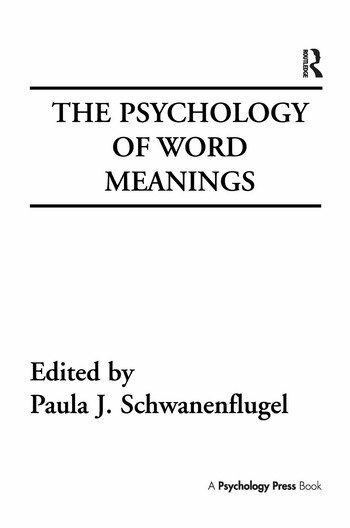 "...quite interesting and well worth reading....for a representative overview of current ideas and research on word meanings in psychology, the present volume does quite nicely."